Measurements: 3.15 x 4.75, or 80 x 120mm. Back of card: Looks like an Indian bas-relief, emperor annointing monkey subjects. In a warm yellowish brown, reflected left & right, up & down to fill all four corners. The cards may be inverted, though there are no inverse instruction in the booklet. Booklet included: A sheet of paper, folded into eight panes. Each measures 3 x 4 inches, or 77 x 112 mm. Publisher: Lotus Press. Country of manufacture not given. Comments: I've never been a fan of bad photography. In tarot, I want to see more than a photo of an old statue, or one flame, two flames, three flames. The card format is there to be used. Here the suits are the four elements, and though substituting elements for the usual Wands-Swords-Pentacles-Cups has been done before in tarot, it should be pointed out that substituting something simple for something complex weakens the overall meaning in the cards. So Fire is one flame, two flames, three flames, etc. Water is one fountain, two fountains, three fountains, etc. Air is one window, two windows, three windows, etc. Earth is one stone, two stones, three stones, etc. Some of them are standing. 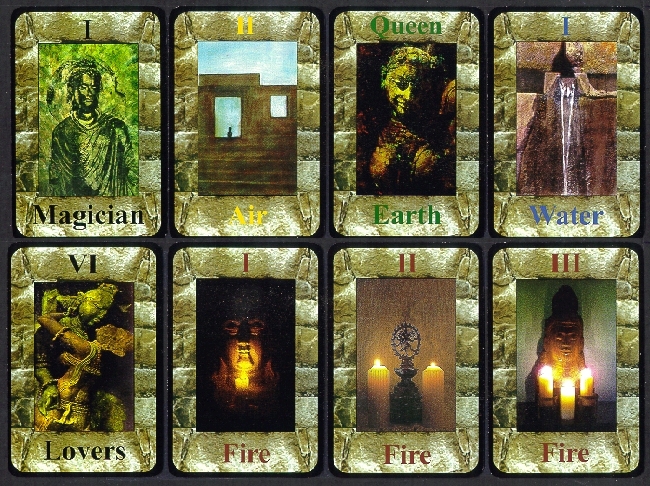 There is a book for this deck, Ancient Mysteries Tarot Book, by Roger Calverley, $17.95. It's not in stock, but I can get it at a week's notice.